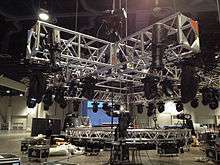 The equipment used for stage lighting (e.g., cabling, dimmers, lighting instruments, controllers) are also used in other lighting applications, including corporate events, concerts, trade shows, broadcast television, film production, photographic studios, and other types of live events. The personnel needed to install, operate, and control the equipment also cross over into these different areas of "stage lighting" applications. The earliest known form of stage lighting was during the early Grecian (and later the Roman) theatres. They would build their theatres facing east to west so that in the afternoon they could perform plays and have the natural sunlight hit the actors, but not those seated in the orchestra. Natural light continued to be utilized when playhouses were built with a large circular opening at the top of the theatre. Early Modern English theatres were roofless, allowing natural light to be utilized for lighting the stage. As theatres moved indoors, artificial lighting became a necessity and it was developed as theatres and technology became more advanced. At an unknown date, candlelight was introduced which brought more developments to theatrical lighting across Europe. While Oliver Cromwell was ruling Britain, all stage production was suspended in 1642 and no advancements were made to English theatres. During this theatrical famine, great developments were being made in theatres on the European mainland. Charles II, who would later become King Charles II witnessed Italian theatrical methods and brought them back to England when he came to power. New playhouses were built in England and their large sizes called for more elaborate lighting. After the refurbishing of the theatres, it was found that the "main source of light in Restoration theatres to be chandeliers" which were "concentrated toward the front of the house, and especially over the forestage". English theatres during this time used dipped candles to light chandeliers and sconces. Dipped candles were made by dipping a wick into hot wax repeatedly to create a cylindrical candle. Candles needed frequent trimming and relighting regardless of what was happening on-stage because "they dripped hot grease on both the audience and actors". Chandeliers also blocked the view of some patrons. There were two different types of Restoration theatres in England: Restoration commercial theatres and Restoration court theatres. Commercial theatres tended to be more "conservative in their lighting, for economic reasons" and therefore used "candle-burning chandeliers" primarily. Court theatres could afford to "use most of the Continental innovations" in their productions (Penzel 16). Theatres such as the Drury Lane Theatre and the Covent Garden Theatre were lit by a large central chandelier and had a varying number of smaller stage chandeliers and candle sconces around the walls of the theatres. Two main court theatres, built between 1660 and 1665, were the Cockpit Theatre and the Hall Theatre. Chandeliers and sconces seemed to be the primary lighting sources here but other developments were being made, especially at the Hall. By the 1670s, the Hall Theatre started using footlights, and between 1670 and 1689 they used candles or lamps. It can be noted that by the end of the 17th century, "French and English stages were fairly similar". There is not much written on theatrical lighting in England at the end of the 17th century and from the little information historians do have, not much changed by the middle of the 18th century. Gas lighting hit the English stage in the early 1800s beginning with the Drury Lane and Covent Garden theatres. In the 1820s, a new type of artificial illumination was developed. In this type of illumination, a gas flame is used to heat a cylinder of quicklime (calcium oxide). Upon reaching a certain temperature, the quicklime would begin to incandesce. This illumination could then be directed by reflectors and lenses. It took some time from the development of this new Limelight before it found its way into theatrical use, which started around 1837. Limelight became popular in the 1860s and beyond, until it was displaced by electrical lighting. 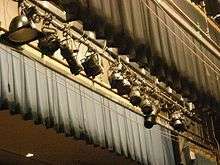 Lighting advances made in English Theatres during this timeframe paved the way for the many lighting advances in the modern theatrical world. Dazzling light effects during a Kanye West show in 2011. Colour temperature is measured in Kelvin. A light's apparent colour is determined by its lamp colour, the colour of any gels in the optical path, its power level, and the colour of the material it lights. Lamp power also influences colour in tungsten lamps. As the lamp power is decreased, the tungsten filament in a bulb will tend to produce increasing percentages of orange light, as compared to the nearly white light emitted at full power. This is known as amber drift or amber shift. Thus a 1000-watt instrument at 50 percent power will emit a higher percentage of orange light than a 500-watt instrument operating at full power. LED fixtures create colour through additive colour mixing with red, green, blue, and in some cases amber, LEDs at different intensities. This type of color mixing is often used with borderlights and cyclorama lights. A gobo of this shape in a fixture with a red gel would produce a pattern like the one shown to the right. Direction refers to the shape, quality and evenness of a lamp's output. The pattern of light an instrument makes is largely determined by three factors. The first are the specifics of the lamp, reflector and lens assembly. Different mounting positions for the lamp (axial, base up, base down), different sizes and shapes of reflector and the nature of the lens (or lenses) being used can all affect the pattern of light. Secondly, the specifics of how the lamp is focused affect its pattern. In ellipsoidal reflector spotlights (ERS) or profile spotlights, there are two beams of light emitted from the lamp. When the cones of both intersect at the throw distance (the distance to the stage), the lamp has a sharply defined 'hard' edge. When the two cones do not intersect at that distance, the edge is fuzzy and 'soft'. Depending on which beam (direct or reflected) is outside the other, the pattern may be 'thin and soft' or 'fat and soft'. Lastly, a gobo or break up pattern may be applied to ERSs and similar instruments. This is typically a thin sheet of metal with a shape cut into it. It is inserted into the instrument near its aperture. Gobos, or templates, come in many shapes, but often include leaves, waves, stars and similar patterns. Focus is a term usually used to describe where an instrument is pointed. The final focus should place the "hot spot" of the beam at the actor's head level when standing at the centre of the instrument's assigned "focus area" on the stage. Position refers to the location of an instrument in the theater's fly system or on permanent pipes in front-of-house locations. Hanging is the act of placing the instrument in its assigned position. Moving lights hanging on a truss, ready for rigging and chain motors. In addition to these, certain modern instruments are automated, referring to motorized movement of either the entire fixture body or the movement of a mirror placed in front of its outermost lens. These fixtures and the more traditional follow spots add direction and motion to the relevant characteristics of light. Automated fixtures fall into either the "moving head" or "moving mirror/scanner" category. Scanners have a body which contains the lamp, circuit boards, transformer, and effects (color, gobo, iris etc.) devices. A mirror is panned and tilted in the desired position by pan and tilt motors, thereby causing the light beam to move. Moving head fixtures have the effects and lamp assembly inside the head with transformers and other electronics in the base or external ballast. There are advantages and disadvantages to both. Scanners are typically faster and less costly than moving head units but have a narrower range of movement. Moving head fixtures have a much larger range of movement as well as a more natural inertial movement but are typically more expensive. Stanley McCandless was perhaps the first to define controllable qualities of light used in theater. In A Method for Lighting the Stage, McCandless discusses color, distribution, intensity and movement as the qualities that can be manipulated by a lighting designer to achieve the desired visual, emotional and thematic look on stage. The McCandless Method, outlined in that book, is widely embraced today. The method involves lighting an object on the stage from three angles—2 lights at 45 degrees to the left and right, and one at 90 degrees (perpendicular to the front of the object). An alternative formulation is by Jody Briggs, who calls them Variable of Light: Angle, Color, Intensity, Distance, Texture, Edge-quality, Size, and Shape. A lighting designer (LD) is familiar with the various types of lighting instruments and their uses. In consultation with the director, the DSM (deputy stage manager) and the scenic designer, and after observing rehearsals, the LD creates an instrument schedule and a light plot as well as informing the DSM where each LX (lighting) cue is designed to be triggered in the script, which the DSM notes down in his plot book. The schedule is a list of all required lighting equipment, including color gel, gobos, color wheels, barndoors and other accessories. The light plot is typically a plan view of the theatre where the performance will take place, with every luminaire marked. This typically specifies the approximate lighting focus and direction, a reference number, accessories, and the channel number of the dimmer system or lighting control console. A lighting designer must satisfy the requirements set forth by the director or head planner. Practical experience is required to know the effective use of different lighting instruments and color in creating a design. Many designers start their careers as lighting technicians. Often, this is followed by training in a vocational college or university that offers theatre courses. Many jobs in larger venues and productions require a degree from a vocational school or college in theatrical lighting, or at least a bachelor's degree. In the context of lighting design, a lighting instrument (also called a luminaire or lantern) is a device that produces controlled lighting as part of the effects a lighting designer brings to a show. The term lighting instrument is preferred to light to avoid confusion between light and light sources. Box/Housing – a metal or plastic container to house the whole instrument and prevent light from spilling in unwanted directions. Lens or opening – the gap in the housing where the light is intended to come out. Reflector – behind or around the light source in such a way as to direct more light towards the lens or opening. Most theatrical light bulbs (or lamps, the term usually preferred) are tungsten-halogen (or quartz-halogen), an improvement on the original incandescent design that uses a halogen gas instead of an inert gas to increase lamp life and output. Fluorescent lights are infrequently used other than as worklights because, although they are far more efficient, they are expensive to make dimmed (run at less than full power) without using specialised dimmer ballasts and only very expensive models will dim to very low levels. They also do not produce light from a single point or easily concentrated area, and usually have a warm-up period, during which they emit no light or do so intermittently. However fluorescent lights are being used more and more for special effects lighting in theaters. High-intensity discharge lamps (or HID lamps), however, are now common where a very bright light output is required—for example in large follow spots, hydrargyrum medium-arc iodide (HMI) floods, and modern automated fixtures. When dimming is required, it is done by mechanical dousers or shutters, as these types of lamps also cannot be electrically dimmed. Over the last six years, LED-based luminares of all varieties and types have been introduced to the market. Some of these fixtures have become very popular, whereas others have not been able to match the output from incandescent and discharge sources that lighting designers prefer. LED fixtures are making a positive impact on the lighting market, and are becoming more popular when compared to the energy usage of current incandescent, halogen, and discharge sources. 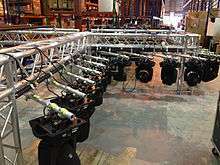 Ovation E-190WW LED ellipsoidal spots (ERS) hanging on 20.5" truss. Most instruments are suspended or supported by a "U" shaped yoke, or 'trunnion arm' fixed to the sides of the instrument, normally near its center of gravity. On the end of such, a clamp (known as a hook-clamp, C-clamp, or pipe clamp—pipe referring to battens) is normally fixed, made in a "C" configuration with a screw to lock the instrument onto the pipe or batten from which it is typically hung. Once secured, the fixture can be panned and tilted using tension adjustment knobs on the yoke and clamp. An adjustable c-wrench, ratchet (US) or spanner (UK) is often used to assist the technician in adjusting the fixture. Most venues ensure crew and performer safety by attaching a safety cable/chain (a metal wire or chain) to the fixture. In the event that the fixture's clamp(s) were to fail, the cable would arrest the fall of the fixture before it could come in contact with a person. Some larger fixtures can weigh over 100 lb (45 kg) and are suspended very high above performers heads. Many venues place strict guidelines regarding the use of safety cables. Hanging the lights or hanging the battons to hang the lights is known as 'rigging'. Within the groups of "wash" and "spot" light, there are other, more specific types of fixtures. This nomenclature also changes across the world depending on location and industry. These fixtures feature a compound lens which allows the designer to place obstructions within the image path which are then projected. These obstructions could be "gobos" or shutters. A profile is a spot light, but allows for precise focusing. This term is mostly used in the United Kingdom and Europe, as "profile spots" in the United States and Canada are referred to as "ERS," "ellipsoidals," or just "lekos," from the original LekoLite created by Joseph Levy and Edward Kook, founders of Century Lighting, in 1933. A Fresnel is a type of wash light and is named as such due to the Fresnel lens it features as the final optical device within the chain. A typical moving light allows the designer to control the position, color, shape, and strobing of the light beam created. This can be used for exciting effects for the entertainment or dancefloor use. 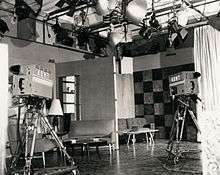 Moving lights are also often used instead of having a large number of "generic" lights. This is because one moving light can do the work of several generics. In the UK the nomenclature is slightly different from North America. This article primarily uses the North American terminology. Although there is some adoption of the former naming conventions it has been normal to categorise lanterns by their lens type, so that what in the US is known as a spotlight is known as a Profile or a Fresnel/PC (Pebble/Plano/Prism Convex) focused tightly on a specific area of the stage (either by repositioning the lens, or by using barndoors) in the UK. A Spotlight in the UK often refers to a Followspot, or any lantern in general which has been focused tightly into a small area. The following definitions are from a North American point of view. UK naming conventions are used in most of the world, in fact most North American theatres will also use the UK terms except when talking in a more general sense (i.e. get a spotlight to focus on that set piece, or 'flood this area'). In Australia and many other places, the lamps inside a theatrical fixture are referred to as bubbles. In North American English, a bubble refers to the protrusion that occurs when one's body (or other oily substance) contacts the lamp. Heat will cause the portion of the lamp which has oil on it to expand when it is on creating the bubble, and causing the lamp to explode. That is why one should never directly touch the glass portion of a lamp. Cleaning with rubbing alcohol will remove the oil. Entertainment Technology's Marquee lighting console. 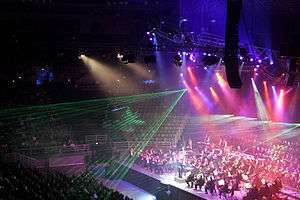 For larger shows or installations, multiple consoles are sometimes used together and in some cases lighting controllers are combined or coordinated with controllers for sound, automated scenery, pyrotechnics and other effects to provide total automation of the entire show, using a specific branch of MIDI technology called MSC (MIDI show control). See show control. The lighting controller is connected to the dimmers (or directly to automated luminaires) using a control cable or wireless link (e.g. DMX512) or network, allowing the dimmers which are bulky, hot and sometimes noisy, to be positioned away from the stage and audience and allowing automated luminaires to be positioned wherever necessary. In addition to DMX512, newer control connections include RDM (remote device management) which adds management and status feedback capabilities to devices which use it while maintaining compatibility with DMX512; and Architecture for Control Networks (ACN) which is a fully featured multiple controller networking protocol. These allow the possibility of feedback of position, state or fault conditions from units, whilst allowing much more detailed control of them. A dimmer is a device used to vary the average voltage applied to an instrument's lamp. The brightness of a lamp is proportional to its electric current, which in turn is proportional to the applied lamp voltage. When the applied voltage is decreased, a lamp's electric current will also decrease, thus reducing the light output from the lamp (dimming it). Conversely, a higher voltage will cause higher lamp current and increased (brighter) light output. Dimmers are frequently found in large enclosures called racks or dimmer racks that draw significant three-phase power. They are often removable modules that range from 20-ampere, 2.4-kilowatt to 100-ampere units. In the case of incandescent lamps, some color changes occur as a lamp is dimmed, allowing for a limited amount of color control through a dimmer. Fades (brightness transitions) can be either UP or DOWN, meaning that the light output is increasing or decreasing during the transition. Most modern dimmers are solid state, though many mechanical dimmers are still in operation. In many cases, a dimmer can be replaced by a constant power module (CPM), which is typically a 20- or 50-ampere breaker in a dimming module casing. CPMs are used to supply line voltage to non-dimming electrical devices such as smoke machines, chain winches, and scenic motors that require constant operating voltage. When a device is powered by a CPM, it is fully energized whenever the CPM is turned on, independent of lighting console levels. CPMs must be used (in lieu of dimmers) to power non-dimming devices that require specific line voltages (e.g., in the US, 110 V, 60 Hz power) in order to avoid damage to such devices. Dimmers are seldom used to control non-dimming devices because even if a dimmer channel is trusted to always operate at full power, it may not be controlled when communications are disrupted by start up and shut down of the lighting control surface, noise interference, or DMX disconnects or failure. Such a loss of control might cause a dimmer to dim a circuit and thus potentially damage its non-dimming device. Devices like moving heads also require independent power, as they cannot function on a partially dimmed channel for power, on top of requiring several other channels in order to convey all of the data they require for their several features. In order to simplify the control of moving head lanterns, instead of assigning channels manually to the lantern, many desks also offer a fixtures section, where one can assign the lantern as a fixture, allowing the desk to organise the data being transferred to the lantern on a much simpler scale for the operator. Fixtures may also incorporate smoke machines, snow machines, haze machines etc., allowing many special effects to be run from a single desk. Increasingly, modern lighting instruments are available which allow remote control of effects other than light intensity, including direction, color, beam shape, projected image, and beam angle. The ability to move an instrument ever more quickly and quietly is an industry goal. Some automated lights have built-in dimming and so are connected directly to the control cable or network and are independent of external dimmers. Pilbrow, Richard (1923) Stage Lighting Design: The Art, the Craft and the Life, Nick Hern Books, London. ISBN 978-1-85459-996-4. 1 2 3 4 Penzel, Frederick (1978). Theatre Lighting Before Electricity. Middletown, CT: Wesleyan UP. ↑ McCandless, Stanley (1958). A Method of Lighting the Stage, Fourth Edition. New York: Theatre Arts Books. pp. 9–10. ISBN 978-0-87830-082-2. ↑ Gillette, J. Michael (2003). Designing With Light: An Introduction to Stage Lighting, Fourth Edition. McGraw Hill. pp. 9–10. ISBN 0-7674-2733-5. ↑ Gillette, J. Michael (2003). Designing With Light: An Introduction to Stage Lighting, Fourth Edition. McGraw Hill. p. 10. ISBN 0-7674-2733-5. 1 2 Gillette, J. Michael (2003). Designing With Light: An Introduction to Stage Lighting, Fourth Edition. McGraw Hill. p. 7. ISBN 0-7674-2733-5. ↑ Gillette, J. Michael (2003). Designing With Light: An Introduction to Stage Lighting, Fourth Edition. McGraw Hill. p. 50. ISBN 0-7674-2733-5. ↑  Learn Stage Lighting - How do I Use Color Effectively? ↑ Gillette, J. Michael (2003). Designing With Light: An Introduction to Stage Lighting, Fourth Edition. McGraw Hill. pp. 62–64. ISBN 0-7674-2733-5. ↑ Gillette, J. Michael (2003). Designing With Light: An Introduction to Stage Lighting, Fourth Edition. McGraw Hill. p. 181. ISBN 0-7674-2733-5. ↑ Gillette, J. Michael (2003). Designing With Light: An Introduction to Stage Lighting, Fourth Edition. McGraw Hill. pp. 152–158. ISBN 0-7674-2733-5. ↑ Lampert-Gréaux, Ellen (2007-05-01). "Remember Stanley McCandless?". Live Design Online. Penton Media, Inc. Retrieved 2008-01-29. ↑ McCandless, Stanley (1958). A Method of Lighting the Stage, Fourth Edition. New York: Theatre Arts Books. pp. 55–56. ISBN 978-0-87830-082-2. ↑ Briggs, Jody (2003). Encyclopedia of Stage Lighting. Jefferson, NC: McFarland. pp. 318–319. ISBN 0-7864-1512-6. ↑ Gillette, J. Michael (2003). Designing With Light: An Introduction to Stage Lighting, Fourth Edition. McGraw Hill. pp. 12–13. ISBN 0-7674-2733-5. ↑ Scenic Art for the Theatre by Susan Crabtree and Peter Beudert. ↑ Connecticut College Theater Services Hazard Communication Guide, Please see 'Lights' section. ↑ Gillette, J. Michael (2003). Designing With Light: An Introduction to Stage Lighting, Fourth Edition. McGraw Hill. pp. 95, 97, 100–102. ISBN 0-7674-2733-5. ↑ Gillette, J. Michael (2003). Designing With Light: An Introduction to Stage Lighting, Fourth Edition. McGraw Hill. p. 96. ISBN 0-7674-2733-5. ↑ Gillette, J. Michael (2003). Designing With Light: An Introduction to Stage Lighting, Fourth Edition. McGraw Hill. p. 89. ISBN 0-7674-2733-5. ↑ Gillette, J. Michael (2003). Designing With Light: An Introduction to Stage Lighting, Fourth Edition. McGraw Hill. p. 92. ISBN 0-7674-2733-5. Wikimedia Commons has media related to Stage lighting.